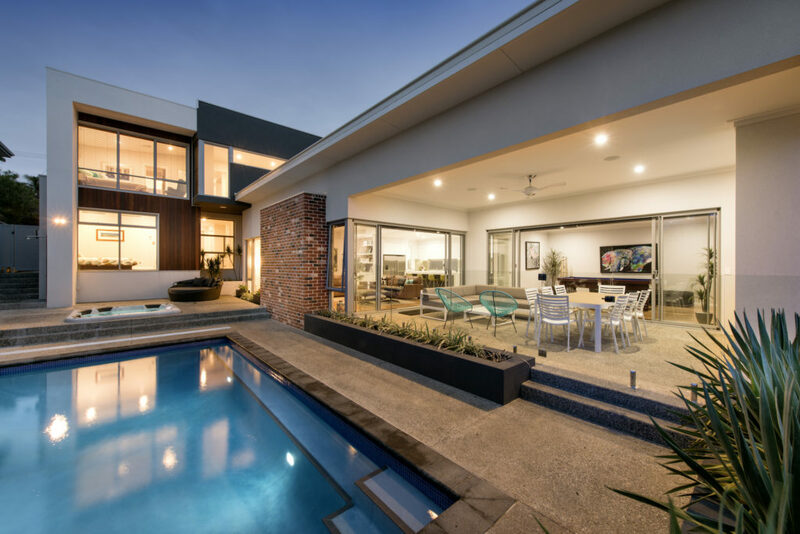 Meet the chic, split-level Doubleview residence that successfully fused together a multitude of styles to create the ultimate contemporary family home- bringing Mid-Century Modern, Cubist, Industrial and a splash of Palm Springs undertones into the mix. The split-level home was cleverly designed to accommodate the sloping block, providing the ability for higher and more dramatic ceilings into the home. The impact of the impressive design is heightened through feature brickwork – a scattered array of restoration red coach bricks both internally and externally. Whilst simple, clean lines are kept throughout the spaces ensuring it isn’t too much. The spacious four-bedroom, three-bathroom home covers the whole family and more, with a downstairs guest suite, a retro-inspired study and a vast open plan living area that forms the path to the outdoor entertaining space. Where you can choose to unwind in the alfresco area, central pool or spa. Everyone can appreciate the four-car garage, fit for the true car enthusiast. Which of course doubles as the ‘man-cave’. The home is complete with a multi-purpose room, which is big enough for a standard-sized pool table, but is currently utilised as a kid’s playroom. Palm Springs style was the muse for the home’s landscaping and furniture pieces to ensure a ‘weekender feel’ was present throughout the home. Enabling year-round entertaining in a fun but relaxed atmosphere. As the refined elegance of the style ties in effortlessly with the Australian lifestyle and climate. Palm Springs has remained significant in architecture and design since it’s birth in the 1930’s, when celebrities flocked to the hotspot for the weekend. The style brings a dash of old-world Hollywood elegance alongside contemporary, minimalist lines. Strikingly bold furniture pieces stand out against the minimalist palette, creating an enjoyable atmosphere in a seemingly plain setting. These vibrant options continue outwards to the alfresco and outdoor entertaining hub. Landscaping choices have accentuated the indoor to outdoor living style that permeates throughout the home.